Adobe has acknowledged that this is an issue with various security software, including anti-virus products running on personal computers, not just corporate users sitting behind various layers of network security services. Here is a link from the Adobe site: http://kb2.adobe.com/cps/191/tn_19166.html#main_KnownIssues. This is because the digital signature is missing since the file was only partially downloaded. 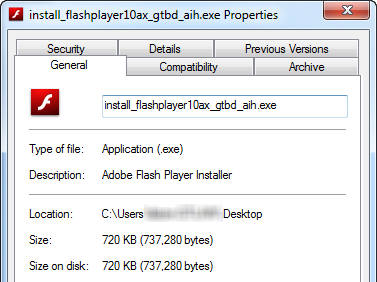 This is also not just limited to the Flash Player web installer download but also the Adobe Reader web installer; I would suspect that other Adobe web installers might also get flagged as malicious and succumb to the same problem. Since encountering, I have not able to recreate the original ntstatus code I saw above, although the file properties remain the same. Instead I see an access denied result when the web installer attempts to query Winsock2, which is part of the Microsoft Firewall Client for ISA. This entry was posted on August 23, 2011 at 12:46 pm	and is filed under Troubleshooting. Tagged: Networking, Process Monitor. You can follow any responses to this entry through the RSS 2.0 feed. You can leave a response, or trackback from your own site. A proxy that deliberately corrupts downloads? That’s just evil. 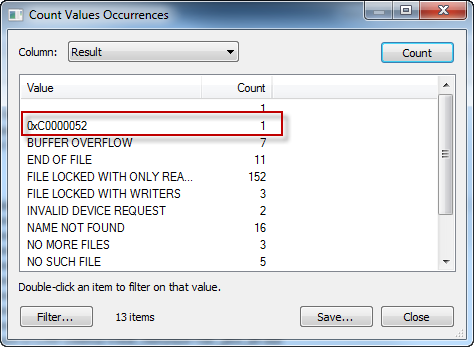 http://blogs.msdn.com/b/ieinternals/archive/2011/04/02/not-commonly-downloaded-warnings-will-be-shown-when-running-corrupt-or-incomplete-files.aspx discusses another case where you’ll see errors for incomplete downloads. Thanks for pointing that out: with SmartScreen enabled you will be warned of the possible harmful nature of the download since the end of the file contains the signature but is missing since the download is being interrupted. Thank you very much for this. I get this problem all the time and have no choice about filtering, so the explanation and link to the installer downloads was very helpful.